Despite in my opinion being the best Japanese Transformers show, Super-God Masterforce apparently didn't go down that well with fans. There were some complaints that it was too different, and ripped off other robot animes. The writers took this onboard, and when Transformers Victory started to air, it was a back-to-basics approach. 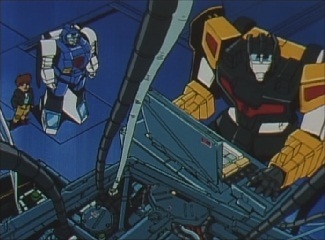 The plot is simple enough: the Destrons want energon to release their fortress, and the Cybertrons must stop them. And straight away Victory has a big problem: it is so boring. Many episode's plots literally are just the Destrons having some plan to get energy, then the Cybertrons come and stop them and say something about justice afterwards. Character development is another issue, as the Cybertrons here are mainly a bunch of guys with zero personalities other than them all being justice lovers, and you rarely learn anything about them. However the Destrons don't suffer from this as much, as the Dinoforce are often hilarious (especially Gouryuu and Kakuryuu) and the Breastforce's attempts to please Deszaras, especially from Leozack and Hellbat, make them much more interesting characters than the good guys. The other problem with the series is the animation. The animation is very good, however, it comes at a price: stock footage, and lots of it. 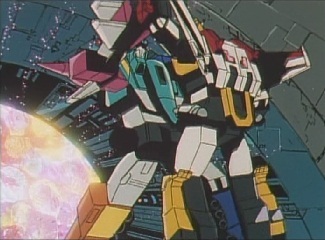 Headmasters and Masterforce had it, but nowhere near to the level of Victory. 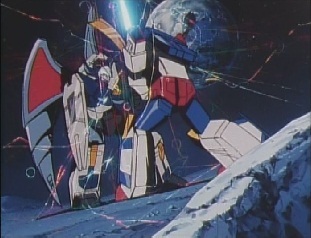 You'll see Star Saber transform in the same way at least once per episode, and all the combiner teams have also got stock transformation sequences you'll quickly get fed up of seeing. And then of course there are the clip shows: when Victory was broadcast, there were 6 clips shows that had no new animation at all. So far things don't look good, but then something happens. God Ginrai battles with Deszaras and loses. The Cybertrons are put into a crisis, and some actual character development takes place within the good guys! And slowly but surely the plot begins to get more interesting, to the point where I actually think I prefer the ending of this series to that of Masterforce: it has two spectacular ending episodes which are full of action and excitement, and a really good final fight between Star Saber and Deszaras. Just a pity that all the really good stuff only happens at the very end. The question I ask is if most people are going to bother sitting through the rest of it. Victory sits between the other two Japanese-exclusive Transformers series -better than The Headmasters, but nowhere near as good as Super-God Masterforce. It does get to be a decent show towards the end, but like I said, whether most people would want to bother watching up to that point is another matter.